What are some of the things most important to us? Our families, our faith and the charities that touch our hearts come to mind for most. Others might also add to that list our assets we accumulated with hard work throughout our life. With over 50 percent of adults in the United States not having a will, the things most important to them may not be taken care of the way they might have intended. We all know the importance of a will and what purpose they serve. It’s just taking that first step. With August being National-Make-A-Will Month, what better time than now? Do not let state laws determine who will inherit your property/assets. Over the years, the so many individuals have had bequests through their wills or trusts, and had the Diocese of Ogdensburg, their parish, a Catholic school, Catholic Charities, Missionary Projects of the Diocese of Ogdensburg, St. Joseph’s Nursing Home, the Bishop’s Fund Appeal, the Foundation of the Roman Catholic Diocese of Ogdensburg and other ministries and institutions of the Diocese of Ogdensburg as one of their final beneficiaries. Other donors who have been called home to God in the past several years have used charitable gift annuities as well as their wills to provide for the future of the diocese. In commemoration of their faithfulness and the commitment of those today and tomorrow who will make such gifts, the Memorare Legacy Society was established in 2008. It is through this society that the Diocese of Ogdensburg thanks donors for their support of the beneficiaries listed above. The Memorare Legacy Society honors and recognizes the generosity and vision of those who have chosen to leave a legacy to the Diocese of Ogdensburg through estate or deferred gifts. An annual Mass and luncheon is held each May for the Memorare Society members with Bishop Terry R. LaValley officiating. One qualifies for membership by designating a portion of his or her assets to pass at death to the any of the above mentioned. These gifts may be accomplished by a simple statement that you have remembered the church in your will or similar document, such as a trust, life insurance policy, charitable gift annuity, designation of an IRA or 401(k) or any other more complex transactions. Members of this society are those who have informed the diocese of a planned gift that, in the future, will benefit the Diocese of Ogdensburg or any of its parishes or programs. This ensures a continuous commitment of care to the church and its vision. Members’ names will not be made public unless they specifically give their consent to do so. A special thank you to current members of the Memorare Legacy Society: Jack Andrew of Old Forge, Msgr. Joseph G. Aubin of Plattsburgh, Dr. Lisa Breitenbach of Heuvelton, Therese Bruyere of Ogdensburg, Father Daniel L. Chapin, Father Douglas Comstock of Alexandria Bay, Paul and Julie Duflo of Cape Vincent, Judith Kelly of Massena, Helen Knepp of Ogdensburg, Father Arthur J. LaBaff of Clayton, Scott and Kim Lalone of Ogdensburg, Loretta Lanzione of Clayton, John McCarthy of Massena, Father Gilbert B. Menard of Plattsburgh, Mr. and Mrs. Patrick Pearson of Watertown, Msgr. Leeward J. Poissant of Plattsburgh, Deacon and Mrs. William and Frances Raven of Black River, Michael Roach of Ogdensburg, Deacon Bernard Slate of Clayton, Kathleen St. Denis of Plattsburgh, Father Bryan D. Stitt of Canton, Father Richard S. Sturtz of Schroon Lake, Joseph Tebo of Canton, as well as several who prefer their intentions to remain anonymous. 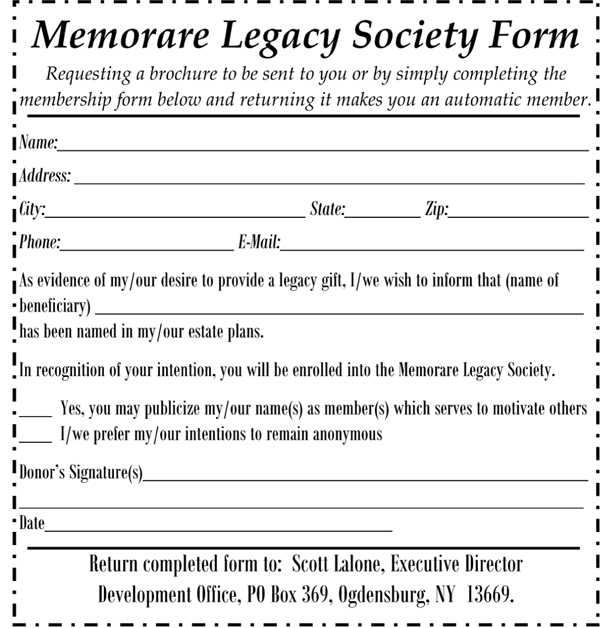 It’s easy to become a member of the Memorare Legacy Society. Request a brochure be sent to you or simply complete the membership form included on this page and return it to become a member.